Consensus on this one was that we all really liked it! To learn more than that though, you're going to have to jump BEYOND THE SPOILER-VEIL. On the most surface level, this a novel about a magical traveling circus. I have to admit that I am—impressed, I suppose: I'm still not sure how much of an homage to Bradbury's “Something Wicked This Way Comes” this is. Structurally, and content-wise, it's so similar, but beyond the core concept of the circus, and a few Shakespeare riffs (Tempest & Hamlet instead of the Scottish play, though), there's nothing to concretely tie it to Bradbury. And you certainly don't need to be familiar with “Something Wicked” to enjoy “The Night Circus”. When you get below that surface level, though, you find that it's a novel about a...magical traveling circus. And that's okay! I have only a few critiques of the novel. The tension of the book, and the circus itself, arise from a proxy war between two magicians—they've both chosen apprentices (Celia & Marco) and set them against each other in what I will call, in scare quotes, “a contest”. The quotes are necessary because the Celia and Marco are not clear on what the contest is or how it works. Their mentors (father, in Celia's case) are not forthcoming or clear about what it is or how it works. As a reader, I really can't avoid the conclusion that Morgenstern doesn't really know what it is or how it works, and discovered this fact too late. Indeed, the final monologue from one of the mentors has the air of an excuse for this oversight, tacking on the moral that...things are hazy and not clear cut, basically. Ah yes, morals. Now, I don't need some perfect Disneyfied moral comeuppance where the villain bites it in the end—but I do find it a bit odd when characters don't confront what seem like fairly simple moral facts within their story. Example: Celia and Marco are trapped in a contest they didn't choose to be in, that they don't want to be in, that is keeping them apart, twisting the lives of a great many bystanders (everyone involved with the circus, a few of them rather horrifically), and indeed killing two of them. And all of this can be clearly laid at the feat of Alexander & Hector/Prospero, the magicians who set this all in motion. But Celia & Marco don't seem to try to get out from under this arrangement, and no-one confronts the fact that all the bad things that have happened can be laid quite clearly at two people's feet. Also, it doesn't read as sinister in the book, but the more I think about the circus going and going, everyone in it condemned to a kind of unaging purgatory, the more ambivalent I feel about that as a “happy ending”. Those concerns aside: a lovely book! Full of odd and arresting imagery. Scene-painting, filling in lots of rich detail, is definitely a strength of Morgenstern's. The elaborate tent exhibitions—most of the ones we see are kinds of mazes, follies, curiosities, rather than acts—very much caught our attention, as did the elaborate “Midnight Dinners”. 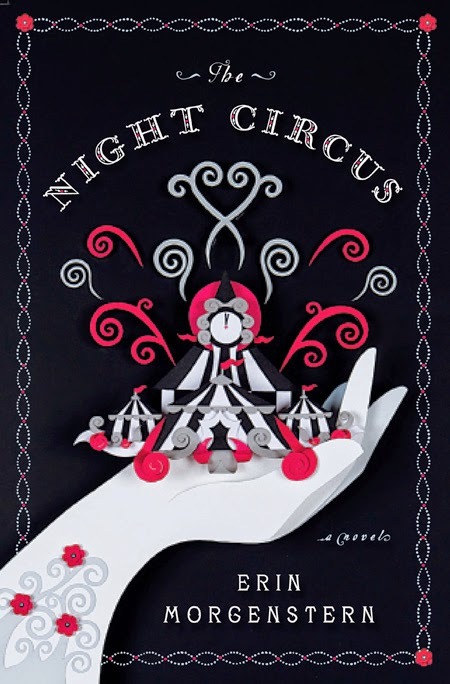 The color contrast—everything in the circus is black and white, while many of the other scenes are full of color—made us wonder a lot about how the novel would look if adapted for the screen. Something like Sin City, something like The Wizard of Oz, perhaps. Film adaptation occurred to quite a few of us—there's something quite cinematic about this novel. Indeed I would say that the dreamlike scenes that kind of pop out of the novel are stronger in many ways than the plot, and it has a lot of visual elements that worked very well in the mind's eye at least--the rêveurs all in black but with bright scarlet scarves, the Ice Garden, Celia's costumes changing mid-scene, the giant clock at the entrance. We also compared it to a lot of film and visual media, particularly Gaiman/McKean works (Sandman, Mirrormask, Coraline); Delia also brought up "The Cabinet of Dr. Caligari" and we mentioned Nosferatu/Shadow of the Vampire for color effects as well. Clearly there's a subtext of horror as well as the fantastic that we're picking up on here, although reading it the horror elements didn't stick in my mind too much outside of one or two scenes. All told: an excellent read, I burned through it in just a couple days. Recommended. Sulzer SF/F will next meet Tuesday, January 20th—book not selected yet but it will be soon. There's some good ones up for voting on!